You might want to read my blog today. 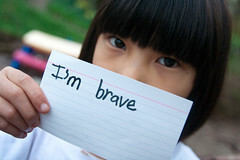 It’s along the lines of being brave. It’s about the temptation to “take the God parts out” of your writing when others don’t appreciate the scriptures and references to God. it isn’t really very good if it isn’t really real is it…? it’s scary being real sometimes. Yes, it sure is, Amy! Thanks, JoJo. I stopped by your blog and shared my thoughts. Great quote. That should definitely go on my writing wall in my classroom!